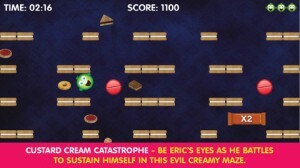 Feed Eric Biscuits iPhone Game Review: Phe-Nom-Nom-Nom-inal! 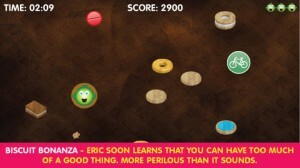 Feed Eric Biscuits is an iPhone game developed by Studio Plinth. This clever app is actually four games in one, making it a smart choice for App Store shoppers looking for a game that has tons of replay value. Eric wants biscuits, but he can’t eat too many, or he’ll get fat. You need to temper his hunger with a bit of exercise, and avoid those diet pills! As we mentioned before, Feed Eric Biscuits is really four games in one package. 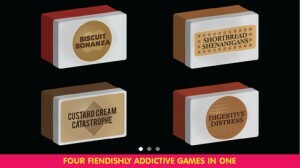 The four game modes are Biscuit Bonanza, Shortbread Shenanigans, Custard Cream Catastrophe, and Digestive Distress. In Biscuit Bonanza, your job is to tilt the screen so Eric can eat tons of cookies. In Shortbread Shenanigans, you must help Eric avoid “shortbread juggernauts” in his quest to fatten up. In Custard Cream Catastrophe, the gameplay screen becomes a maze of yummy custard cream sandwich cookies that Eric must navigate around. 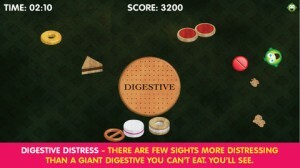 Finally, in Digestive Distress, you face off against some very large (and mouthwatering) digestive biscuits. Tilt-based controls can be a bit hit or miss, in my experience. Some apps have such sensitive controls that the tilt controls are almost rendered useless, while other tilt games have a more balanced calibration. I’m happy to say that Feed Eric Biscuits managed to get the tilt controls just right. Feed Eric Biscuits is cute, kind of retro, and lots of fun to play thanks to its four different game modes. The only warning I have about this game: don’t play it on an empty stomach. After a while, those cookies start to look mighty tasty. 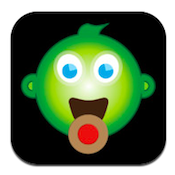 Feed Eric Biscuitsis compatible with iPhone, iPod touch, and iPad. Requires iOS 5.0 or later. This app is optimized for iPhone 5.